There are cities that conjure tingles when referenced for their mystique and romance. London, Paris, and New York all bring a smile to the faces of many, but for me, nothing can compare to the sultry breezes and intriguing architecture of New Orleans. Steeped in history, mystery, and a whole lot of sin, it is one of the most original spots on earth. Where old-world blends with modern day, the people, atmosphere, and culture are like no place else. It’s this exotic blend that makes the town such a worthy backdrop for my novel Blackwell. Despite time and the advent of technology, there is a rhythm in New Orleans that seems impervious to change. What was true in the time of Magnus Blackwell is still true today. However, it’s the darker side of the Big Easy that makes it a pivotal part of Magnus Blackwell’s world. Ghosts, voodoo, and eclectic people have persisted in New Orleans almost as long as the city has been in existence. Murky myths add to its allure and make it a thrilling spot to set any literary adventure. 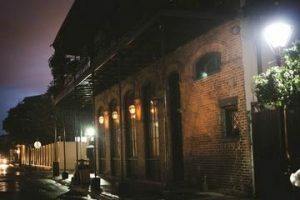 Famous as the most haunted destination in the United States, residents of New Orleans are as accustomed to ghosts as those in Los Angeles might be to smog, traffic, and noise. The ethereal is woven into the fabric of the dreamy iron balconies and shuttered doorways. Complaints of unintelligible voices, screams, footsteps, and unexplained knocking are as common in early morning banter between neighbors as cordial greetings. When you live in the French Quarter, hearing, “my ghost kept me up all night,” is the norm. Perhaps this is why spectral visitors are just as much a facet of life as red beans and rice on Mondays. And with the rise of haunted tours, ghosts are now big business. Taking what was once an inconvenience and turning it into a cash cow. But ask any of the locals if they would be happier relieved of their supernatural visitors, every single one of them would say no. New Orleans wouldn’t be the same without its ghosts. For those who love the city, it’s reassuring to know you never have to leave it. Unlike other cities where the topic of voodoo was spoken in hushed whispers, New Orleans readily embraced the religion. The blending of the African and Catholic customs reached its zenith along the Mississippi River. Because of voodoo’s influence in the Crescent City, words such as gris-gris, ju-ju, and voodoo doll were introduced into the American vocabulary. Even famous practitioners of the art became legends. Marie Laveau is still regarded by many as the queen of voodoo. Her annual St. John’s Eve ritual performed on the banks of Bayou St. John continues to this day. And even though her religion has become more commercial that practical, the essence of it adds an air of enchantment to those tightly packed Creole cottages along St. Anne Street. And some insist, on a cold day when the light is right, you can see the regal figure of Ms. Marie strolling along the cracked sidewalks of The Quarter and keeping an eye on her hometown. Probably the most memorable part of any visit to The Big Easy is the numerous encounters with its Bohemian inhabitants. Their unique character embodies all that is inviting about New Orleans. From quirky traditions to flamboyant celebrations, everything this town encompasses comes alive in its citizens. When life and death are celebrated with the same exuberance, one can’t help but be enchanted. There is something about the people that gets under your skin. A haven for writers, poets, artists, and musicians, the creative pulse resonates through every cobblestone of Jackson Square. Maybe this is why New Orleans has been the setting for so many great stories. Like a heady gumbo, it stirs the soul. Reason enough to make it one of the settings in my book. There are many delights and a few dangers in New Orleans, but despite everything, it is a place where the impossible can seem probable. I can think of nowhere else to set the dark and sinister tale of Blackwell. It is a bastion where lost souls can find rest, forbidden religions can influence a culture, and people are encouraged to march to a different drum. All that is extraordinary defines this fabulous city, and all who embrace it are touched by magic. © 2019 Alexandrea Weis. All Rights Reserved.